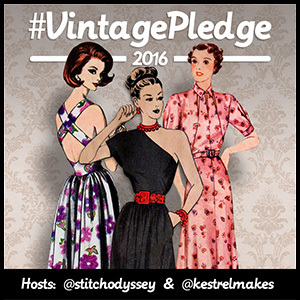 Sign Up To #VintagePledge 2016! Hmmm....I have been sewing 70's reprints recently....I might have to join. I'm so excited that this is back! Also this years button is gorgeous. I've looked around, and cannot find mention of this button! could you direct me perhaps?! Ooh, me! I've aquired a few vintage patterbs lately, this will be a good way to motivate me to actually make them up! During 2016, I, Kirsten, pledge to sew or knit at least three vintage (or reproduction) patterns from my stash. How do you grab a pin? I'm pledging to make 1 pattern this year after failing to make it to 3 last year and the year before. I have a gorgeous skirt pattern in my stash that I'm dying to make for the summer. I failed last year, but this year I'm trying again! I pledge to make two vintage patterns. I'm definitely in! I've been waiting for the 2016 one to appear and I pledge to experiment more with my vintage patterns and tackle things that terrify me like stretch fabrics and lingerie. Yey!! I have been waiting for this to be announced! I haven't taken part before, but this year I am definately in. I pledge to make at least two skirts from recently acquired 1970s skirt patterns. Last year I managed to make of my lovely 2 vintage patterns!! While not at all close to what I was hoping for, they were my very first, so it was a start. This year I plan to make more. Thanks for keeping it running for 2016! I love seeing all the wonderful things everyone is sewing and I love the inspiration posts too!! I, Maria Shell, pledge to make a garment a month using using vintage patterns. Thank you for sponsering this. I am looking forward to joining in on the fun for the first time. Here goes - I pledge to 20 patterns this year. Oh yay! I'm soooo excited! I'd love to contribute a July post, if you're looking! Thank you for organizing this again! I am happy to participate for the first time this year and pledge to make at least 5 garments using vintage patterns. Fantastic! 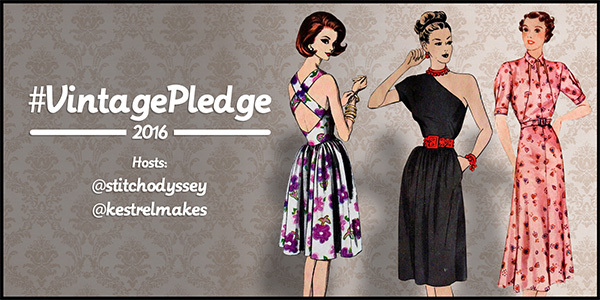 I look forward to seeing the makes and I am honored to help support the 2016 Vintage Pledge! Request to pin: sagworks. My pledge is to make at 6 well fitting and well constructed garments. I sew a lot (using vintage patterns) and want to create things I am proud and that look good outside and inside. I can't wait to see everyone's makes! I'm VERY new to sewing and don't have any vintage patterns, let alone the confidence (or understanding) to make anything... yet! Maybe by the end of the year after I get some more practice under my belt! I love vintage styles. I was fairly successful with last year's pledge, even though it took me until December to make the trousers. This year, I will make both the 80s knit dress and the 20s dress that doesn't come with a pattern so much as a set of instructions that starts "Start with a basic slip dress and 6 yards of silk chiffon..." I might also crochet that 40s sweater. Yay! Here's my overly specific pledge: I, Kaitlyn, of Kaitlyn's Simply Vintage, pledge to sew up this year; my seven reproduction patterns, my two currently owned vintage patterns, and to find at least three new vintage patterns to add to my stash, sewing up at least two of them. During 2016 I, Pam, pledge to make at least 8 vintage pieces, using both original and reproduction patterns. I have a ridiculous number of vintage patterns so this really shouldn't be a hard target for me - so long as I don't get distracted! Looking forward to seeing this year's makes. I pledge to make as many as I get inspired to do throughout the year! ! Woo hoo! Will definitely be joining in. I think about 5 will be my limit, but I may do more! I haven't joined in before but I've recently discovered a couple of Decades of Style reproduction vintage patterns I love, so this year I'm going to give it a go and pledge to make 2 garments from vintage or reproduction patterns. Charlotte has done a great job on the button! I'm actually going to plan to participate and share this year. I really want to sew up my 40's/50's vintage patterns I've been collecting. During 2016, I, Meg the Grand, pledge to tackle 10 of my vintage patterns, including one that involves redrafting from a smaller size. So excited to join! During 2016, I, Elena, pledge to tackle some vintage and reproduction patterns, trying to use fabrics from my stash. I am so happy you are doing this again. I have more patterns and this will encourage me. I forgot what I pledged last year but only made 3. For 2016, I, Victoria pledge to complete a minimum of 5 vintage or reprinted patterns. As a matter of fact. I completed one already to wear to a wedding. Hope you like it. I, Gabriella, pledge that I'll make at least two vintage garments from (probably repro) vintage patterns during 2016. This is so great! I love to participate! During 2016, I, Anthea, pledge to sew a 30s/40s evening gown, a 20s flapper dress and vintage lingerie. Yes, me too ... One fifties, one eighties and one repro! I am at home on my own, I have just photographed my first vintage make of 2016 this morning and I was wondering would there be a pledge this year and here you are! I whooped out loud even though there is no one here to listen. I have a specific pledge. During 2016, I Jo Roberts, pledge to attempt a vintage pattern without markings because I am frightened of them. I, The Vintage Knitter pledge to do far better in 2016 than in 2015 with my makes and renew my pledge to make at least three garments in 2016 from vintage patterns! Here's to another happy Pledge year to everyone! Of course I am in! I had a lot of fun last year and made some things which were well out of my comfort zone. This year, there are two things I want to focus on: Even more exploring of new-to-me eras of fashion history and making things I will actually wear on a regular basis. Just to give myself some kind of number to aim for, I will pledge to make at six items from vintage patterns. I am so pleased you are continuing this year. I had grand plans last year but next to no sewing got done due to one thing or another. But stand by as I still have the lovely blouse I planned to make, I would like to pledge I will make two tops. Also I would like to pledge that I will use some of my vintage fabrics. I'm hoping 2016 will be more successful than 2015 - I think taking the pledge jinxed me! I'm keeping it small this year and just pledging to sew at least one vintage garment. Looking forward to seeing what everyone makes, it's so inspiring! I, Gretchen of Part Time Lion Tamer, pledge to sew five different vintage (not repro) patterns. One pattern must use vintage fabric. I also pledge to finish my vintage UFOs from 2015. I Michelle of www.tresbienensemble.com hereby declare that I am 210% in for #vintagepledge2016! HOORAY for such success in 2015! It's exciting to see so many people using their vintage collections! I pledge 2 garments this year. Yay! So excited this is starting again. In 2016 I, Elie of attieanddora.com, pledge to sew at least 3 of the vintage patterns in my stash. I, Liza Mae of Sew It Or Throw It, pledge to make six garments total. One from the 40's, 50's, 60's, 70's, 80's, and the 90's. My guess is the 80's will be the most difficult, aesthetically, but only time will tell. Yay! So pleased that the Vintage Pledge is back, and thank you to Charlotte for another fabulous button. I, Black Tulip of blacktulipsewing.blogspot.com, pledge to make at least 4 of my vintage or repro patterns this year. I'm going to try to do better this year than I did the last two years. I plan to make at least three garments this year. Taking the plunge and joining in this year! I'm going to make if fairly easy on myself because I've no idea what I want to tackle first between vintage patterns, reproduction patterns, and then I have loads of vintage knitting books of my Mom and Gran's, so... I, Sarah of Prairie Girl Knits, pledge to tackle some vintage craftiness, whether it be sewing, knitting or both, this year. I, Vanessa Casad of knitnsew.blogspot.com/, pledge to make three garments. One from the 40s, 50s, and 60s, from reproduction patterns. In 2016, I, Kerry of Kestrel Makes, pledge to complete 2 vintage sewing projects I've already started, make a wedding guest dress and sew 2 further items from vintage patterns. I'm back for more this year! This has been my favorite sew along ever, you guys are the best! I've even got my pledge post started. I loved seeing everyone's makes last year. I have a busy year ahead but I pledge to make at least one vintage make in 2016. Since I completely failed last year I'll keep the same pledge and see 3 vintage or reproduction dresses! Hopefully I'll do better this year! I pledge to make 5 things out of vintage patterns, at the very least, and at least one of which will be successful enough to enter into normal rotation in my wardrobe. My pinterest is Nikki Resendes. I'd love to be able to post my makes! I've never taken the pledge, though I always follow with interest! So I'm taking the leap this year, and pledging to make at least 3 vintage patters- at least one original vintage and one repro pattern. Ooo I really need to take part in this, this time around. I only have a small stash of vintage patterns, but two of the pattern I'm dying to make, so hopefully this will be my year!
' I Sarah of Fashion Brick Road. Pledge to make up 2 vintage patterns from my stash'. Finally going to join in this year...but i'm not going to have much time to start until July! I pledge to make two vintage patterns this year. I am SO IN !!! I, Nicole, pledge to complete at least 5 vintage patterns (sewing or knitting) from my stash in 2016. This includes the UFOs that taunt me from their corner. I, Pat, plan to make at least 2 vintage garments in 2016. I, Andi, pledge to complete 2 of my vintage or vintage repro patterns this year. It's the same as last year's goal and will hopefully achieve it this year. I,Sandra, pledge to try to make up some of my vintage patterns as part of the Vintage Pledge 2016. Look forward to seeing the other makes! I was so impressed by everyones vintage makes last year but, as a new sewer, was a bit apprehensive of joining in but this year I'm going to do it! I, Krystle Snook, pledge to produce two articles of clothing a month this year, at least 4 hats a bag or two, 4 knitteds, plenty of undies (because everyone could use plenty), a coat and at least one suit! And all by the thousands of vintage patterns I have/hoard and rarely use of course! It will be tough to not or hardly drape and draft this year but at least my husband will stop saying I shouldn't buy more patterns because i don't even use the ones I have! Hmph! I'm in again this year! Only managed 3 of 5 (I think? I'm terrible.) last year, but I'll be cementing my pledge at Revisionist Vintage soon! I'm going to throw caution in the wind and finally join in. I, Essi P. pledge to make at least two dresses from my vintage pattern stash during 2016. 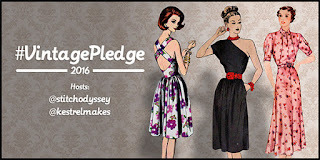 I, Arlette, pledge to make at least 10 vintage projects during 2016! I am so excited to join! I'm joining in this year too, I pledge to make at least four garments from my patterns, keeping it small and acheivable I hope. There are plans for more of course...! I, Caroline, pledge to make a 1920's blouse, using my tried & tested vintage pattern. I, Antoinette, pledge to make at least 4 vintage (pre-1940) patterns this year. Thank you for doing this! What fun! I have just taken up sewing and got my first sewing machine, I'm in for this pledge. I'm going with two garments, hopefully wearable although Ican't promise. I'll definitely learn lots though. Thanks for organising the vintage pledge again! I'm going to keep things simple and achievable.....I, Ruth, pledge to sew 2 projects from vintage patterns this year. I'm so happy you're doing this pledge again as it means I can join in. I pledge to make items using at least three of the vintage patterns from my stash and also at least two of the advanced repro patterns in my stash! I Kelly, pledge to sew at least three projects and complete my WIPs from my vintage pattern stash as part of the Vintage Pledge 2016. I will try and post a little more this year, and as its a big birthday too I am already planning the party dress,30's and pattern hacked can't wait! Oh and its july too,perfect! I have a crazy pledge: make at least one item from each decade between 1910 and now; I'm calling it "100 in 1" because it's 100 years of clothes, made in 1 year. Admittedly, the 2000's don't at all count as vintage, but that's still a minimum of nine articles of clothing I'll be making from vintage and reproduction vintage patterns. I've finished the fifties and thirties items already this year. SO excited about making all these things and seeing what everyone else is creating! Very excited to play properly this year. My pledge is one vintage make a month. Please can I have permission to pin? I'm https://uk.pinterest.com/penny0281/, thanks! I've inherited my Mum and Aunt's collection of patterns, mainly from the 70's & 80's so I'd like to try sewing some of them up. I Rachel, pledge to sew at least 3 vintage patterns from my stash this year. I am shocked, shocked that I put up the emblem and link on my blog and didn't sign up here. Alright, I am going to sew one vintage pattern per month (but I confess that will include some eighties stuff. Does it count that I sewed them before in the 80s?) Possibly more. As always I can't wait to join the fun. This year my #VintagePledge is to make 5 vintage patterns. Late to the party but have started my first item, my pledge is to make a full outfit (non-specific number to hedge my bets) from the 1950's. I have started my first, Simplicity 1278, & hope to draft some from the Haslam Dress Cutting System. Wow let's get this party started right??? I have looked and drooled over this challenge in past years and thought "I have vintage patterns out the wazoozoo and I like to rock a "retro" (trendy aren't I) look more often than not. So I have decided this year is the year woo-hoo I pledge to make a set of separates and a dress at least and some outerwear, and lounge-wear if I can find something I love, from purely vintage patterns this year as a way of updating (LOL) my retro looks. Much love and luck to everyone have fun. Hugs n Stitches!! Thanks, please let me know if I'm doing this wrong! I'm in! I have a couple of reproduction patterns from around 1920 I want to try, plus a couple of patterns from 1960 to 1963 that I found in my grandmother's house after she died. I'd like to make at least one thing from these as a kind of connection with her. Problem is, she was petite (maybe 5 feet tall on a good day) and I am 5'6". She was a size or two smaller than I am. Also, she wore a girdle every day of her life, even under her bathing suit, so I will need to modify the patterns a bit. During 2016, I, Andrea Murley-Anderson, pledge to sew at least six garment from either vintage or reproduction patterns. Pretty please add me to the Pinterest board! @amurleyanderson (I have two Pinterest accounts, but this is the one I have solely to keep a record of my sewing patterns!). Looking forward to seeing all the makes this year! This year I decided to not buy any new clothes, instead I, Jayne Coney, pledge to make the majority of my clothes using vintage & reproduction clothing. Mostly from stash fabric. Surfed over here via a post on themonthlystitch... what a fab challenge! I too have a stash of vintage/retro patterns & pattern mags - I love looking at them but don't often make them up! Count me in for this challenge! During 2016, I, Laura Walker, pledge to sew at least four items from vintage or reproduction patterns. I pledge to sew 5 vintage patterns this year. Each garment has to complete an outfit, ie I already need the separates and shoes to match. No more orphan garments! I, Gabrielle of UpSewLate, pledge to sew at least one more vintage midi skirt from an 80s pattern, to finish sewing the two vintage dresses I started last year, and to sew my daughter the 1970s dress she's requested. And as an extra challenge, I'll aim to sew at least one of the vintage patterns I normally just drool over. I totally failed last year on my bid to take part but I loved seeing everyone else's makes. This year I pledge to sew at least one of my vintage patterns. I failed last year so I need to do it properly during 2016. I, Mayumi, will sew at least 2 skirts, 2 dresses and a top/shirt, vintage or vintage reproductions, during 2016. I pledged (on my blog, but not here? Silly me!) to make 10 vintage patterns this year! I finally blogged my first from January, yay! I pledge to make 1 vintage pattern this year. Count me in for this 2016 vintage sewing frenzy!!! I, Toxicita, pledge to sew "some" vintage garments. I am so in! I pledge 4 garments, one of which will be a detailed suit, probably 50s. This sounds so fun! I always try to include a vintage element to everything I sew for my daughter. Why not use an actual vintage pattern? I pledge to seek out and sew from at least 1 (but probably more) vintage pattern for my lovely daughter this year. I MJ of rosielovesaruche pledge to sew at least one vintage pattern in 2016. I pledge to make 1 garment from a vintage pattern during 2016. Bit late to the party, but I, Kirsty of Tea and Rainbows, pledge to sew at least two vintage patterns from my stash this year! I'm in! I pledge to make at least 5 dresses, 2 blouses, and a jacket/coat. I pledge to make 7 vintage or reproduction patterns in 2016! I'm pledging to finish my unfinished vintage projects AND start/complete two new ones this year. Yes, I'm definitely in! I'm not putting a number to how many vintage patterns I'll make but my pledge is to try something that I haven't sewn before. I'm in - I'll make a couple at least.. I have a bunch from the 70's so this should be fun! This will be my first year taking part and I'm so excited! Such a perfect fit for my new retro sewing blog. My pledge is to use up my stash of vintage fabrics on my collection of vintage patterns AND wear some. I've created a big challenge for myself! Especially since I still consider myself a beginner... Anyway I pledge to make one ensemble representing each decade of the 20th century (but maybe not the 90s- we shall see). I'm IN! I've amassed a nice collection of vintage patterns and some really lovely fabric so I pledge to make at least 4 this year. One will be sailor pants from the 30's which I've been dying to make for years. I'm sooo excited! A little late to the game, but I would love to join! My pledge is to make up 3-5 of the patterns in my "To Make" pile. I've already finished one! I am following the board on pinterest, and my username is Bessie Miller. Is it too late in the year to jump on this bandwagon? I don't sew many 'vintage' patterns, [or not what I'd call vintage anyway] but I have been sewing loads of Victorian/Edwardian stuff for my new steampunk craze...does that count? How fun! Question: does it count if the pattern is modified by me somehow (for fit/wearability)? Hi Elisana! As long as an original (or reproduction) vintage pattern is used as your basis, then you can totally make modifications :o) Happy stitching! I inadvertently made a vintage make before getting around to making my pledge (not the worst problem in the world, I guess!) but here it is: I pledge to make up at least three vintage patterns in 2016. One down, two to go! Of course me and my late self. I Carla, pledge to tackle a few of my vintage patterns, hopefully making my first proper 40's suit. I, Kerstin in Sweden, pledge to sew my first vintage/repro pattern this summer. My first time seeing this, I would love to join! I,Alethia,(SewMuchTalent) pledge to make at sew at least one vintage pattern. I even have vintage fabric to use I resourced from a thrift store. Sew exciting!!!! Hi, could I have permission to pin to the pinterest board? My pinterest name is Elizabeth McMillan (ScientistLiz). Thanks! Hi - I finally made my way over to this page. I have a vintage pattern that I've been meaning to make for at least a year. My fabric is already picked out but I need to make at least one more muslin. Maybe I can finish it this year! So here goes: I Chuleenan of C Sews, pledge to make a color-blocked, double-knit fabric dress from a 1970s Vogue pattern by the end of the year. Hi, I have really enjoyed the Vintage Pledge July Extravaganza and I am sad it is over! I just finished my third vintage garment of the year and would like to pin it to the board. Could you give me permission to pin? My Pinterest name is Iris Arctica. Thanks! Ridiculously late in the year, but what can I say, better late than never. I pledge to sew two three vintage patterns by the end of December! I signed up for the past two years, and wasn't able to do anything. I'm signing up today because I actually completed my first vintage pattern. I hope to really do better next year!